Photovoltaic solar panels are relatively new in the UK in any number. In North America, Europe and Australia as well as many other parts of the world photovoltaic solar systems have been installed for many years and so the need for solar panel cleaning has been realised. 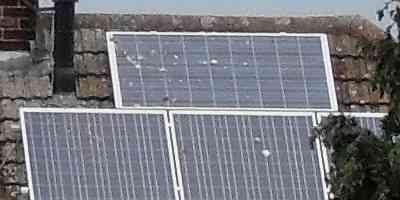 The above image shows solar panels with bird droppings that do not wash off easily with just rain. This will affect the panels performance. To reduce the problem of bird droppings you can put a plastic mesh over your TV aerial to stop birds using it as a perch and messing on the panels below. On the roof and angled skywards the panels will attract dirt, dust, soot, pollen, tree sap and salt crystals in costal regions creating a fine layer of grime. This layer reduces the amount of light reaching the silicon cells under the glass surface and reduces the panel's effectiveness. 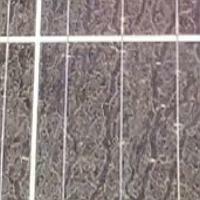 A solar panel that has never been cleaned could be producing almost a third less power than it otherwise could be. Some have reported a ten to fifteen percent loss of solar output due to dirty panels. Boston University in the States have done some research on this and claim that as little as a few grams of dust per square metre can halve their efficiency. It is recommended that you hire a cleaning company that provides a solar panel cleaning service that know how to clean solar photovoltaic panels properly. Do not just hire a window cleaner unless they have specific knowledge and experience in this area. They may end up at worst damaging the panels or not effectively cleaning the panels so you end up no better off. A company who is experienced in cleaning PV panels will have the proper equipment. Using standard windows cleaning tools means that they will end up leaving soap residue behind and hard water spots as any water on the panels surface evaporates. If you have free solar panels installed or are thinking of getting them you should check with the installer to see if they pay for getting the panels cleaned. It is in their interest to keep them running at optimal efficiency. Won't the rain wash the dirt off the panels? During the summer there may be long periods where it does not rain and the summer is when photovoltaics produce the most electricity. When it does rain some of the loose dirt is removed but more is deposited in its place. Some types of soiling such as that from birds will remain for many weeks and even months if they are not cleaned. Is there a way to prevent my solar panels from getting as dirty? At the moment for residential installations the most practical and proven method is to just get them cleaned regularly. There are special coatings that can be applied to the surface of the panels which claim to prevent dirt from sticking. If you are going to go down that root you need to make sure you check with the panel manufacturer first. There are other systems that are not really practical for residential systems such as spray systems built into the roof that regularly hose down the panel. There are even solar panel cleaning robots that can clean them. There is also a system that uses an electric charge to lift the dust of the surface of panels. The 100 percent renewable energy supplier Good Energy claims the UK could be generating all of its electricity using renewables by 2050.